Mortgage and Real Estate News and Tips: Mortgage Bond Market Analysis - What the heck just happened? 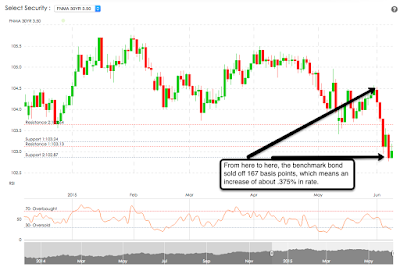 Mortgage Bond Market Analysis - What the heck just happened? We haven't closed that low since October 6th of last year and we were pretty close to that point on November 12th. We are almost 7 months removed from November 12th and still seeing very mixed results in the economy. I don't think we will see a continual rapid rise in rates. There is too much ambiguity in the market. Experts are still calling for a correction in the stock market of 10-15% which will impact bonds, most likely in a positive way since the money typically flows out of stocks into the safe haven of bonds in scenarios like a market correction. Additionally, a Fed rate hike of any magnitude, and I don't know of any experts advocating rate hikes soon or that are big, will probably help interest rates as well as it will make investors in the stock market a bit uneasy which means more money will likely flow to the safe haven of bonds again. At this time, I would float with caution. We've had a big sell-off that doesn't appear likely to continue at this point and we may see some buying in the bond market as investors see this as an opportunity to buy bonds at a good price. Be very judicious about watching the bond movement as they dictate rates. Call me if I can help with anything mortgage related: 702-812-1214.